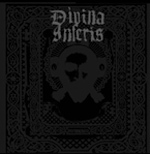 Divina Inferis spits it's first full-length curse towards the aura of the Nazarene. 40-minutes of sounds that reflect the unifying of mind, body and soul. Chaos, suffering and blasphemy function as lyrical keys in gaining a connection with the source of evil.